Note: This was originally posted on April 28 at The Lesbrary, a lesbian book blog where I am now a monthly reviewer! Many thanks to Danika at The Lesbrary for letting me join the team. Hollywood has its stars: as one begins to fall, another is there to shine. Cassidy Hyland has gotten the cold shoulder from her co-star on the hit sci-fi show Time Trails, Brenna Lanigan, for long enough. Hoping that her son's birthday party will find a way to spark a connection between them, Cassidy has no idea that she will find herself longing for much more than a friendship with Brenna. From the warmth of an surprise hug to the heat on a sunlit mountain top, learning about each other brings Brenna and Cassidy closer to a truth - and a love - they never expected to find. Lara Zielinsky highlights two women who find themselves on opposite sides of the acting divide: Brenna is approaching the "over-the-hill" status that actresses over 40 find themselves facing; Cassidy is the younger, gorgeous woman brought in to bring a fresh face and look to the series. After a period of time of aloofness, Cassidy uses her son's birthday party to show Brenna that she is a good person, sparking more than a truce in their dealings with each other. After finishing the book, I realized that I knew so much about these two women and how they deal with their changing feelings. The friendship that grows between the two women is born of work and motherhood, but the attraction is there from the beginning, more so for Cassidy. As she tries to figure out what draws her to Brenna, she works on disentangling herself from both her issues with her abusive ex-husband and her relationship with show writer Cameron, which puts her in more and more uncomfortable positions on set. Brenna's second marriage to upcoming politician Kevin Shea was a fast decision and one that does not provide Brenna the stability she expected it to bring. The emotional connection between the two is tenuous at best, living and working long-distance. Brenna's sons still refer to him as "Mr. Shea" even after a year. At first I was concerned about how slow the story seemed to be progressing. Hollywood is full of "in bed in fifteen minutes" storylines, as are lesbian romances. While the story take a long time to build, readers get to see not only the development of Brenna and Cassidy's relationship, but glimpses into their lives as actresses and mothers. 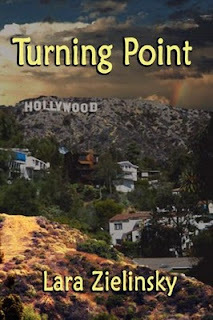 The plot uses some devices that seem a little far-fetched: both women travel to the same store in all of Los Angeles to shop for their fateful camping trip, Cameron catches the two in a kiss and immediately wonders if "Cassidy will let him watch". Even with those trite moments, the growing love between the two, and the self-reflection that it causes them both, is sure to touch a memory in many readers' minds. It certainly did mine. 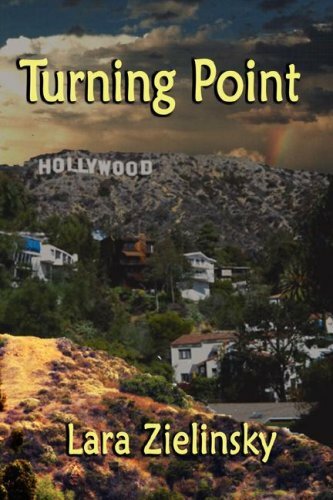 Turning Point is a slow but steady heart-felt story of two women discovering their feelings for each other. Decorated in the glitter of stardom, it is the people behind the television characters that have to strip away the artifice to find the love they really want.